On Thursday, the National Symphony Orchestra spotlighted last century’s greatest forgotten musical voices, the Polish composer Mieczysław Weinberg (1919-1996). 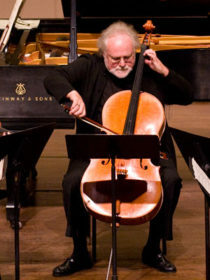 As Anne Midgette notes in her Washington Post review of the Kennedy Center concert, the NSO was joined by Latvian classical violinist Gidon Kremer, who “arrived at the NSO as the soloist in a concerto by a composer whose music the NSO had never played before.” Kremer is now “one of the composer’s most ardent champions,” writes Midgette. Indeed, in a recent profile of Kremer, the New York Times explain that the Russian-trained virtuoso has been on a mission to discover and champion hidden 20th-century masters. On January 27, ECM New Series released recordings by Kremer and Kremerata of all four Weinberg chamber symphonies, along with a premiere recording of Weinberg’s early Piano Quintet of 1944. These great musical achievements follow nearly a decade of Pro Musica Hebraica’s successful efforts to bring recognition to the great Soviet Jewish composer works through live performances of his masterpieces. Then, in our fall 2011 concert — The Last Romantics: Jewish Composers of Interwar Europe — Jascha Nemtsov & Friends played Weinberg’s famous and beloved “Piano Trio,” now widely regarded as a recovered classic of twentieth-century chamber music. Semer Records, a label started by devoted to publishing the music of Jewish Berlin, survived just six years before the Nazis burned its records, murdered most of the contributing artists, and sent its founder, Hirsch Lewin, to Sachsenhausen concentration camp. For decades, it was assumed that the music of Semer Records vanished in the ashes of Kristallnacht. But as Jordan Kutzik writes in The Forward, the music has been preserved. And thanks to a new group of Jewish musicians called the Semer Ensemble, audiences can once again hear the remarkably cosmopolitan sounds of Jewish Berlin. The Strad called the ARC Ensemble’s recent album of Polish-American composer Jerzy Fitelberg’s chamber works “first-class music, well played and recorded.” The Boston Globe named it one of the top classical albums of 2015. And now, the album is recognized in the 2017 Grammy’s category of Best Chamber Music/Small Ensemble Performance. The album includes Fitelberg’s String Quartet No. 2 (1928), which the ARC Ensemble performed in Pro Musica Hebraica’s Spring 2015 concert at the Kennedy Center, Before The Night: Jewish Classical Masterpieces of Pre-1933 Europe. But the work of first-rate composers like Jerzy Fitelberg, whose journey into oblivion was the direct result of nothing but ideological politics, speaks for itself, and deserves its rightful place in the firmament of musical art. Thanks to Wynberg and the ARC Ensemble, Fitelberg’s rightful place in the firmament can no longer be questioned. This Monday on WETA-FM: Broadcast of Pro Musica Hebraica’s Concert of the Musical Legacy of Jewish Spain. On Monday, August 22, 2016 at 9 pm (EST), WETA’s Front Row Washington will broadcast Pro Musica Hebraica’s Fall 2015 concert, Piety and Passion: The Musical Legacy of Jewish Spain. 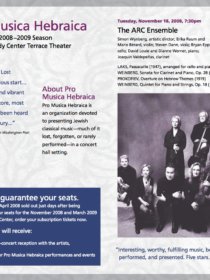 In the first-ever exploration of this unique legacy, Pro Musica Hebraica presented a concert of Sephardic and Spanish Jewish music. Audience favorites the Amernet String Quartet, Ensemble-in-Residence at Florida International University, returned with friends, mezzo-soprano Rachel Calloway and guitarist Adam Levin, to explore medieval Sephardic ballads and modern masterpieces by composers Mario Castelnuovo-Tedesco, Joaquín Rodrigo, Carlos Cruz de Castro, and Alberto Hemsi. To listen to the concert on Monday night, Washington-area residents can tune in to WETA 90.9 FM. If you live outside of the DC area, you can tune in live on WETA’s website. Comments Off on This Monday on WETA-FM: Broadcast of Pro Musica Hebraica’s Concert of the Musical Legacy of Jewish Spain. During the 1920s, the city was home to as many as 20,000 Jews. Some were refugees who wanted to escape czarist pogroms in Russia and, later, the Bolshevik Revolution and World War I. But unlike the Jews in Shanghai and other China cities with large Jewish communities, many in Harbin were also merchants and entrepreneurs who had come from Russia and Europe seeking economic opportunities. Read the rest in the New York Times.